Scotland's Caroline Weir says reaching the 2015 World Cup would be the "final step" of their transformation under head coach Anna Signeul. The Scots welcome the Netherlands to Tynecastle on Saturday for the first leg of their play-off semi-final, before travelling to Rotterdam for the return five days later. The winner of the tie will face Italy or Ukraine for a place amongst the elite in Canada. And Weir believes making their first finals would cement the impact Signeul - who has guided her charges to a record-high of 21st in the world - has had on the Scottish women's game since taking over in 2005. "She's a really positive coach; she always focuses on the positive things that we do," 19-year-old Weir told BBC Scotland. "She's taken the team so far in the years she's been here, and not just the team, but women's football in this country. "It has come a long way in the past five or six years, and a lot of credit must go to Anna for that. It would be great if we could make the final step of getting to the World Cup." Weir is well aware of the task Scotland face to clinch a place at next summer's spectacle and, while remaining optimistic, she insists they have put in an effort to be proud of, regardless of the outcome. Acknowledging the quality she expects from Roger Reijners' outfit, the midfielder, who netted in the 9-0 qualifying victory against the Faroe Islands, said: "I played against them at Under-19 level in the summer and they were a typical Dutch team. "They liked to keep the ball, and while I don't know too much about their senior team, I know of a couple of the players who moved up from that level and I'm sure they will play in the same way and with the same style. "We're all very excited - this was the aim from the beginning, to get to the play-offs. These are the kind of games that you want to play in. I want to enjoy the occasion. "We've definitely given ourselves the best chance to qualify this time around and we're quietly confident that we can get the results, but we'll just take things one game at a time." "I've only been involved in the last couple of games but it's been a successful campaign. Sweden were obviously favourites to qualify straight from the group and they've done that so, for us, the play-offs was probably the more realistic goal. And while we've achieved what we set out to with that, now we want to go all the way. "We've definitely given ourselves the best chance to qualify this time around and we're quietly confident that we can get the results." When asked to sum up the secret behind Scotland's recent success, Weir said: "More people are full-time and train a lot more, and I think that shows in our results." 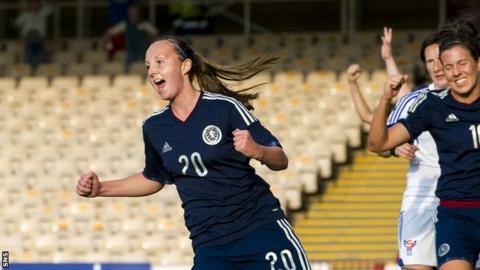 Arsenal Ladies player Weir has represented Scotland at every level, having made her senior debut in 2013, and she is relishing the challenge of competing at the top level for her country while establishing herself with her club side. "It has been a big jump, going from the U19s to the 'A' squad, but it's an honour to be there, and to actually play as well," she said. "It's a big difference in terms of the physical and technical differences, but it has been great so far. "We're only going to get better; we've got a lot of good young individuals that can come through. "With Arsenal, I'm trying to get into the starting 11, and hopefully that will come next season. "Internationally, my aim is to continue getting picked for the squad, and if I play then that's a bonus at this time. "Obviously, I'd love to feature in every game but it's tough to get into the team, so I'm taking it as it comes. You can never foresee what's going to happen in the future but I'll keep working to my targets."